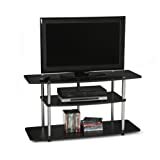 From the multitude of TV stands available on the market for modern television sets, gamers can have the opportunity to choose stands that are meant for specifically gaming. Many people are not even aware that such stands exist, so what makes these products different? The best gaming TV stands can have a reserved spot for anything: consoles, controllers, TV mounts, game racks, etc. If you have a nice TV for gaming, it would be great for you to also have the right stand for it. A rack can help you to keep your latest games in order so that your friends can see them when they come to you. 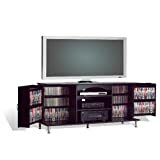 You will have an organized gaming space that will allow you to rapidly find your favorite titles when you need them. The type of stand that you buy can depend a lot on your space requirements, but also on your esthetic preferences and other things. In the search for the best stand, there are certain factors to consider, such as style, the material from which the stand is made, durability, the available space, size, the suitability of the stand for your TV, your available budget and the stand’s functionality. 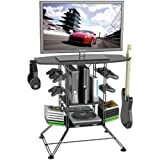 Because of all the sizes, styles and colors that may be available on the market, it can be difficult and time consuming to search for the right gaming stand. An important aspect is the location in the room where the stand will be placed. The style can be determined by the room appearance and look of your TV. 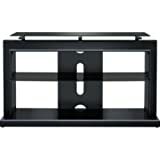 Gaming TV stands are meant for console gamers. 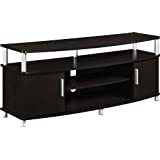 There is a standard layout for console stands that has been used for many years and continues to be used. The best of these stands are made to hold all your stuff and to help you access your items easily. 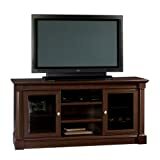 Depending on the type of room in which you will be using the stand, we can split console stands in two main categories: console hub stands and entertainment centers. Console hub stands have a design that is meant for kids rooms, teenager rooms and any other room that serves the purpose of fun. Most designs of this type are simple and cheap. These stands don’t look very professional, as the focus is on usefulness and storage. One of the best features of a gaming TV stand is the available space for gaming consoles. 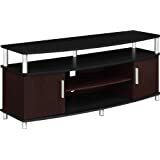 Entertainment centers have standard shelving and drawers and they look professional in comparison to console hub stands. We have chosen three amazing gaming TV stands that are worth buying because of these reasons: gaming support, affordability, esthetics and storage support. While the first option is a console hub stand, the other two are entertainment centers. Atlantic Centipede is the ultimate solution for console gamers just as the Atlantic Game Desk is the ultimate desk for PC gamers. Even if the stand may give you the impression that it cannot hold too many items, it is very strong, as it is made from steel wire. In order to suit any pretentious requirement, the stand has six holders for game controllers, two game racks on the sides and a large center shelf. You can place three different consoles in it, vertically. You can keep up to twelve games on the side racks. The top of the stand supports the TV and has two small extensions (one on each side) where you can hang your headphones and various gaming accessories. There is no TV mount included in the package. Television sets of about 37 inches can fit best to the top of the stand, which can hold up to eighty pounds. If you want to store more than twelve games, you may want to check other stands that are larger. With this type of stand, air circulation is optimal, so you never have to worry about your consoles overheating. 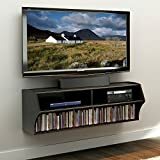 You have three main shelves: the first one is for the TV, the second one is for your consoles and the third one can be used for smaller devices, games or anything that fits in. On each side there are three hangers. These hangers are easy to remove when you want to take them out. Even if this stand looks weak, it is actually quite sturdy and stable. You can try to shake it and see for yourself that it stays well on the floor. Atlantic Centipede Game Storage and TV Stand for kids room is the best option for any gamer who has less space in the room. Not only space can be saved, but also money, because the model is really cheap for what it provides. When the stand is equipped with all your stuff, it will look compact and strong. Even if the approach to this design is minimalistic, everything is held together the proper way. If you want a simple, small and compact stand that can keep all your gaming items together without affecting your wallet too much, this is the best product for you. 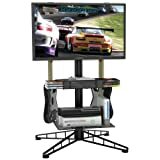 This stand is from the entertainment centers category of gaming stands, supporting television sets up to 50 inches. Many people prefer this stand because of the affordable price and the smart design. The stand is designed in such a way to allow great cable management and optimal shelve usage. The stand is also made to support anything that you would like to place on it. You don’t have to worry about its durability, because it is ensured by the sturdy metal frame. You can use the two spacious shelves in the center for your newer items and the doors on each side to hide your older items. 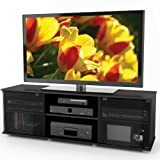 Altra Furniture Carson TV Stand can be awesome for a multi-console setup and for storing a huge number for new and older games. You can choose from two colors: espresso or cherry with two tones of black. There are also some chrome accents here and there. 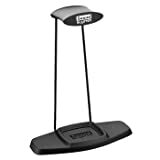 For gamers who have larger screens, the manufacturer can provide a version of this stand that can support TV’s up to 70 inches. But, this version is more expensive. If you afford a larger TV, you probably would afford the larger stand. 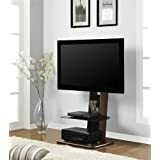 The Altra Furniture TV Stand can be perfect for a living room, but the standard version can go well in other rooms too. Besides that open space in the center and the storage space on the sides with doors, there is even more space right below the top of the stand, where you can store anything you want. While this is quite a cheap product, you may be pleasantly surprised of how heavy it is. The holes in the back can be really helpful for cable management. The open space of the center shelves can keep components cool. With its modern design and appearance, this stand seems more expensive than it really is. 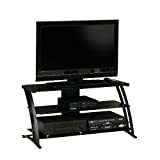 If you have a larger living room and a 60 inch TV, this stand from the entertainment center category can be the best choice. TV’s of up to 64 inches can fit well. The stand has a nice Ravenwood finish and some partially hidden areas with tinted and tempered glass that make the stand look amazing. Tempered glass is much stronger than regular glass. This glass breaks into small chunks instead of small pieces, avoiding high risks of injury. The stand has three areas: an open area in the center and two concealed areas on the sides. Storage is the purpose of using these hidden areas. You can place your consoles, media players and Blu-Ray players in any of the three spaces, as each of them has two horizontal sections, for obtaining a total of six different spaces. The open space is good for letting air circulate through the shelves and keep your devices cooler. For the construction of the stand, Medium Density Fiber Board has been used, because it is stronger and more moisture resistant than particle boards. It is also free of the defects that natural wood may have. The glass doors can open easily with just a single touch. Magnetic catches are making this possible. You just have to touch the glass for switching between your different consoles and media players. Sonax FB-2600 Fiji is more than you can get from a gaming TV stand. You can store not only your gaming consoles, but also any media player that you use with your TV. We can say that the stand is more than just a gaming stand. It is a multi-purpose stand. With a large TV screen, this setup can look like one of the most elegant entertainment centers. It can be used best in a larger living room.